Be prepared this winter! 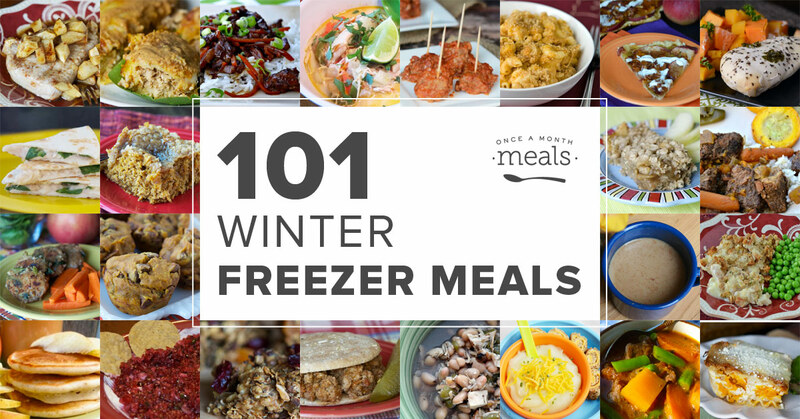 We have 101 Winter Freezer Meals so you have meals to eat at a moment’s notice. Winter meals – Still use the seasonal produce that can be located but also leans heavily on canned and frozen vegetables as many of our favorites are not in season. Winter is a time for more soups, more slow cooker meals and more meals that simply bring us warmth from the inside as we deal with the cold on the outside. But make no mistake about it, these meals can be frozen ahead, thawed and warmed for the perfect cold, winter day – even if you are expecting company! For you visual types, check out our Pinterest boards full of Winter Freezer Meals. If you happened to stumble onto this post during the wrong season, check out our seasonal posts for Fall, Summer, or Spring! If you’re interested in only slow cooker recipes for winter, check these out too! Just to let you know I couldn’t repin your recipes. I kept getting a message that they’d been marked as having inappropriate content or spam. The issue has been resolve. Thanks for the heads up.